The Fire Side: Simple things and daft cats. Well, another week is done. There are 4 working days til the Easter holidays. 8 days until our first wedding anniversary (where did that go?!). We've not had any snow this week, though it has been bitterly cold and very windy. We've had to turn the heating up again as our house has been very cold, so I hope that doesn't mean our DD will need to go up. You know I posted a bit ago about not getting a new coat? I've changed my mind. I've ordered one, and it should be here during the week. I shall post about it when it arrives. Tonight me and the husband are going out for a meal, followed by a concert in a church, with local singers performing. It should be a lovely evening, and I'm looking forward to spending some time just the two of us. I can't decide what to wear though - do I go for comfort or glam? I'm sure comfort will win out this evening, as it's so cold outside. We shall see! Django is guarding a pair of my socks - as in, he wouldn't let them go! I'd put them out on the bed, and the next moment, he'd got hold of them and was guarding them. The way he was looking just seemed as if he was saying "Go on, I dare you to try and get them!" 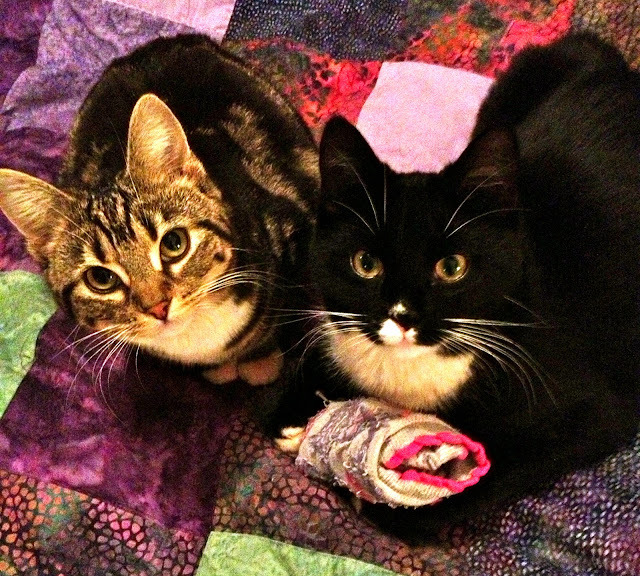 Luna then decided to go to his side, so both of them were just sat watching me, with the socks. They are daft, and cute. Our puss cat brings socks downstairs each evening as a present for us. Much meowing is involved in this ritual. We once had a cat that took a liking to next door's knitted tea cosies!